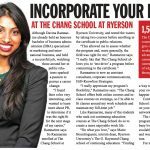 Davina Ramnarine, an assistant consultant in our Toronto office, was recently featured in a series of promotional pieces for the Chang School at Ryerson University, focusing on graduates of the school making great strides in the workplace. Here is one of the features about Davina: an advertorial piece that ran in Metro newspaper on Tuesday, August 27, 2013. Please click on the thumbnail to see the full article.